Cathaoirleach Cllr Norma Foley and Deputy Chief Executive, Charlie O’Sullivan with the winners of the annual Road Safety Calendar competition hosted by Kerry County Council. 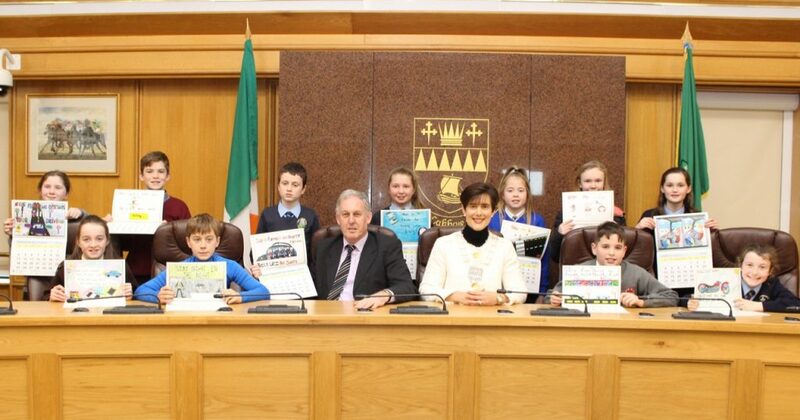 PRIMARY school pupils from around the county have used their artistic skills to highlight and promote road safety through their winning submissions to the 2019 Kerry County Council Road Safety Calendar competition which is hosted annual by the local authority. Charlie O’Sullivan, Deputy Chief Executive, Kerry County Council this week presented the twelve winning pupils from various primary schools with a copy of the 2019 Road Safety Calendar, featuring their artwork and a ‘Road Safety Pack’ from the Road Safety Authority. The Cathaoirleach of Kerry County Council, Cllr. Norma Foley presented individual prizes to the winning pupils. Pupils were invited to enter a picture containing a road safety message and the winners were selected for inclusion in the calendar by a judging panel. Ciara O’Donoghue, Loughguittane N.S., Muckross, Killarney; James Neeson, St. Oliver’s N.S., Killarney; Pádraig O’Halloran, Castlegregory N.S. ; Áine Newsome, Scoil Bhreac Chluain, Annascaul; Áine O’Sullivan, Lissivigeen N.S., Killarney. Cathaoirleach Foley congratulated each of the pupils on their wonderful drawings and said that “the standard of the competition is extremely high and it is great to know that these pupils, through their drawings, are contributing to raising awareness of road safety throughout the county”. Co-ordinator of the event, Michelle Mullane, Staff Officer, Operations, Capital Infrastructure and Safety Department, was delighted with all the entries: “We had over 400 entries from schools around Kerry. It is fantastic that the teachers/pupils got so strongly involved and it is my hope that each pupil who took part will have an increased awareness of road safety as a result”.